Stockport Council’s Digital by Design programme is an investment in digital technologies and business transformation to enable many council services to be delivered online, support budget reductions, deliver better outcomes for citizens and build internal capabilities to meet the future needs of the authority. Recognizing the need for people to access council services flexibly, Stockport embarked on an 18-month partnership with ThoughtWorks to develop an entirely new single-view website and portal stockport.gov.uk. 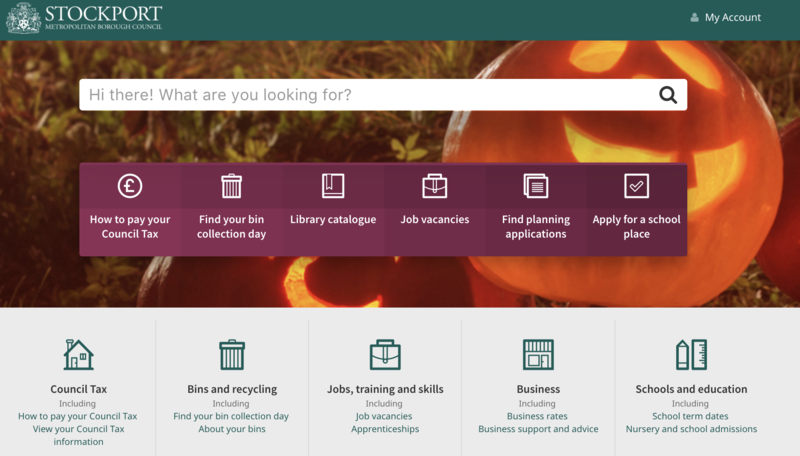 The new site is designed to provide online self-service tools for the people of Stockport. Whether the need is to access information about benefits, report a faulty street light or schedule or cancel an appointment, residents now have the ability to do so online. Since launch, approximately 60% of contact has been through digital means. Improved online interaction has reduced home-visit waiting times for vulnerable customers from 10 to 2 weeks, and brought waiting times for office appointments down from 2 weeks to 1. Over 3,000 faulty street lights and blocked grids were reported via stockport.co.uk in the period July - Sept, saving almost 200 staff days. Stockport Council and ThoughtWorks also worked to support and improve internal services such as Child Safeguarding. A new initiative Signposts was introduced to build a communicative bridge between social workers and the wide variety of agencies working locally in child protection, for example, schools and Greater Manchester Police. Via Signposts, social workers working in child protection now have a single view to access background information about young people and families in a safe and secure way. By building this end-to-end journey, more relevant data held by police and other agencies is accessible to support decision making. The simple visual interface allows professionals to spot patterns and quickly get a feel for issues and risks that are faced by a child or family. Each new digital tool and service has been released in minimum viable form to test the user experience. This is to ensure they are fit for purpose, that citizens see significant and continuous improvements, and that value is delivered early and continually post-launch. This new way of working has removed the barriers between departments and teams. It also means Stockport is delivering better services, faster, and improving relationships with people living in the borough. ThoughtWorks is transforming the way public service providers improve citizens lives through emerging technologies. Find out more.